Throughout our great land, the Rocks and the Neats wage a remorseless battle over how to drink whiskey -- but one company dares to ask, "Can't we all just get along?" Yes, we can, by Sippin on the Rocks. SOTR's a Colorado outfit that peddles an exercise in literality: actual rocks that chill your whiskey (like a Pet Rock, only not content to just lay there doing nothing). 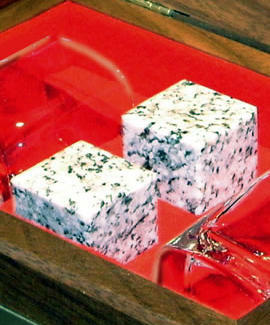 First, imported Scottish granite's portioned into cubes, then polished; freeze 'em for 2-3 hours, drop one in your malt, and your beverage'll chill, softening the booze's burn while avoiding the ice-based watering-down and impurity-release that give booze snobs license to be fake-upset. Each pair comes in a walnut gift case that includes twin crystal glasses, the perfect gift setup for dads/bosses/The Thing's recently-castrated brother. SOTR's future plans include patented vodka, tequila, and bourbon rocks, made with stone from Russia, Mexico, and the US -- because the only thing the Rocks and the Neats can agree on is that people who use Canadian stones in Irish whiskey deserve the most ferocious justice the streets have to offer.